Addressed to Charles Lamb, of the India-House, London. In the June of 1797 some long-expected friends paid a visit to the author's cottage; and on the morning of their arrival, he met with an accident which disabled him from walking during the whole of their stay. One evening, when they had left him for a few hours, he composed the following lines in the garden-bower. The exclamation-mark after 'prison' suggests light-heartedness, I suppose: a mood balanced between genuine disappointment that he can't go on the walk on the one hand, and the indolent satisfaction of being in a beautiful spot of nature without having to clamber up and down hill and dale on the other. Not to be too literal-minded, but we get it, that STC is being ironic when he calls the lovely bower a prison. His exaggeration of his physical disabilities is a similar strategy: the second exclamation-mark after 'blindness!' is there to let us know that he is not actually blind. But then again, irony is a slippery matter: he's in that grove of trees, swollen-footed and blind, but gifted with a visionary sight that accompanies his friends and they pass down, further down and deeper still, through a corresponding grove into a space 'o'erwooded, narrow, deep' whose residing tree is not the Linden but the Ash. He watches as they go into this underworld. Does he remind you of anyone? The poem imagines the descending sun making the heath gleam. The clouds burn now with sunset colours, although 'distant groves' are still bright and the sea still shines. The poem makes it clear Coleridge is imagining and then describing things Charles is observing, rather than his own (swollen-footed, blinded) perspective: 'So my friend/ Struck with deep joy may stand ... gazing round'. And what he sees are 'such hues/As cloathe the Almighty Spirit' [37-40]. So it's a poem about the divine as manifested in the material. In all, the poem thrice addresses 'gentle-hearted CHARLES!' [28, 68, 75]. Interestingly, Lamb himself genuinely disliked being addressed in this manner. 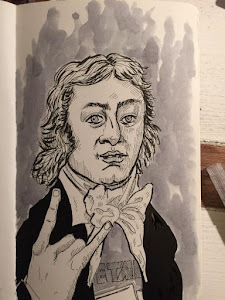 'For God's sake (I was never more serious)', Lamb wrote to Coleridge on 6 August 1800, having read the first published version of the poem in Southey's Annual Anthology, 'don't make me ridiculous any more by terming me gentle-hearted in print'. A week later he wrote again even more insistently, begging Coleridge to 'blot out gentle-hearted' in 'the next edition of the Anthology' and instead 'substitute drunken dog, ragged-head, seld-shaven, odd-ey'd, stuttering, or any other epithet which truly and properly belongs to the Gentleman in question' [Letters of Charles and Mary Lamb 1:217-224]. Coleridge didn't alter the phrase, although he did revise the poem in many other ways between this point and re-publication in 1817's Sybilline Leaves. STC didn't alter the detail because he couldn't alter it without damaging the poem, and we can see why that is if we pay attention to the first adjective used to describe the vista the three friends see when they ascend from the pagan-Nordic ash-tree underworld of the 'roaring dell': 'and view again/The many-steepled tract magnificent/Of hilly fields and meadows, and the sea' [21-3]. Churches, churches, Christian churches. Lamb is in the poem because he was Coleridge's friend, and because he actually went on the walk that the poem describes; but Lamb is also in the poem as an, as it were, avatar or invocation of the Lamb of God, whose gentleness of heart is non-negotiable. Read this way the poem describes not so much a series of actual events as a spiritual vision of New Testament transcendence, forgiveness and beauty. Hence, also, the trinitarian three-times address to the gentle-heart. refers back to the paradox which gives the poem its title. How can a bower of lime-trees be a prison? And, even as he begins to show how this can be, he proves that it cannot be, since the imagination cannot be imprisoned.’ [Donald Davie, Articulate Energy: an Inquiry into the Syntax of English Poetry (1955), 72]. The imagination cannot be imprisoned! has the confident ring of a proper Romantic slogan, something to be chanted as we march through the streets waving our poetry banners. But there are significant problems with Davies' reading, I think. One is that it doesn't really know what to do with the un- or even anti-panegyric elements; the passive-aggression of Coleridge's line, as the three disappear off to have fun without him, that these are 'Friends, whom I never more may meet again' —what, are they all going to die, Sam?—or the sinister vibe of the descent-into-the-roaring-dell passage. Or, indeed, the poem's last image: an ominous solitary rook, 'creaking' its 'black wings' [70, 74] as it flies overhead. Plus, to be a pedant, it's sloppy to describe the poem's bower as exclusively composed of lime-trees. 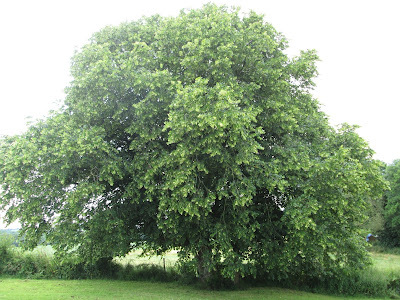 In fact the poem specifies that Coleridge's bower contains a lime-tree, a 'wallnut tree'  and some elms . And, actually, do you know what? I'm going to suggest that it's not mere pedantry to note that. Critics are fond of quoting elements from this poem as it they were ex cathedra pronouncements from the 'one love' nature-priest Coleridge: 'That Nature ne'er deserts the wise and pure' ; 'No sound is dissonant which tells of Life'  and so on. But it's not so simple. Take the rook with which it ends. It's true, the poem ends with Coleridge blessing the ominous black bird as it flies overhead, much as the cursed Ancient Mariner blesses the water-snakes and so sets in motion his redemption. But read more closely and we have to concede that, unlike the Mariner, Coleridge is not blessing the bird for his own redemptive sake. It's Charles, not the speaker of this poem, who believes 'no sound is dissonant which tells of Life'; and it's for Charles's benefit that Coleridge blesses the bird. Indeed the whole poem is one of implicit dialogue between Samuel and Charles, between (we could say) Swellfoot and the Lamb. There's no need to overplay the significance of 'Norse' elements of this poem. It's there, though: the Yggdrasilic Ash-tree possessing a structural role in the underside of the landscape ('the Ash from rock to rock/Flings arching like a bridge, that branchless ash/Unsunn'd' [12-14]). And we can hardly mention this rook without also noting that Odin himself uses ominous black birds of prey to spy out the land without having to travel through it himself. I'd suggest Odin's raven provides a darkly valuable corrective to the blander Daviesian floating Imagination as locus of holy beauty. Richard Holmes thinks the last nine lines sound 'a sacred note of evensong and homecoming' [Holmes, 307]. Which is fair enough, although saying so rather begs the question: sacred to whom? Odin's sacral vibe is rather different to Christ-the-Lamb's, after all. Ravens fly over the heaped-up battlefield dead because those slain in war belong to Odin. Grim but that's the way Norse godhood interacted with the world. 'Friends, whom I never more may meet again' indeed! ...there's no mistaking the singular God being invoked; and He's the Christian one. That said, 'Lime-Tree Bower' is clearly a poem that encompasses both the sunlit tracts above, and the murky, unsunn'd underworld beneath: that is, encompasses both Christian consolation and a kind of hidden pagan potency. It is (again, to state the obvious) a poem about trees, as well as being a poem about vision. By 'vision' I mean seeing things that we cannot normally see; not just projecting yourself imaginatively to see what you think your distant friends might be seeing, but seeing something spiritual and visionary, 'such hues/As cloathe the Almighty Spirit' [41-2]. It makes deep sense to locate such shamanic vision in a copse of trees. Single trees—particularly the Edenic Tree of Knowledge of Good and Evil and the cross on which Christ was crucified—are important to Christian thought, but groves of trees are a locus of pagan, rather than Christian, religious praxis. And the title makes clear that the poem is located not so much by a tree as within such a grove. The trees comprising Coleridge's poem's grove are: Lime, Walnut (which, in Coleridge's idiosyncratic spelling, 'Wallnut', suggests something mural, confining, the very walls of Coleridge's fancied prison) and Elms, these last heavily wrapped-about with Ivy. There's also an Ash in the poem, though that's not strictly part of the grove. Let's unpack this a little, using the sort of frame of reference with which Coleridge himself was liable to be familiar. So the Lime, or Linden, tree is tilia in Latin (it grows in central and northern Europe, but not in the Holy Land; so it appears in classical and pagan writing, but not in the Bible). Ash is Fraxinus, and is closely associated, of course, with Norse mythology: the world-tree was an Ash, and it was upon it that Odin hung for nine-nights sacrificing himself to gain the (poetic) wisdom of runes. Walnut, or Iuglans, was a tree the Romans considered sacred to Jove: its Latin name is a shortening of Iovis glāns , “Jupiter's acorn”. Then there's the Elm ('those fronting elms' ), Ulmus in Latin, a tree associated by the Romans with death and false visions. So, for instance, one of the things Vergil's Aeneas sees when he goes down into the underworld is a great Elm tree whose boughs and ancient branches spread shadowy and huge ('in medio ramos annosaque bracchia pandit/ulmus opaca, ingens'); and Vergil relates the popular belief ('vulgo') that false or vain dreams grow under the leaves of this death-elm: 'quam sedem somnia vulgo/uana tenere ferunt, foliisque sub omnibus haerent' [Aeneid 6:282-5]. That, then, is Coleridge's grove. One needn't stray too far into 'mystic-symbolic alphabet of trees' territory to read 'Lime-Tree Bower' as a poem freighted with these more ancient significances of these arborēs. area, quam viridem faciebant graminis herbae. umbra loco venit. Non Chaonis afuit arbor. the heaven-born poet sat down and strummed his lyre. vines tendrilling on their own, or covering the Elms. witnessed their partner sprouting leaves on their worn old limbs. Maybe Coleridge, in his bower, is figuring himself a kind of Orpheus, evoking a whole grove with his words alone. That is, after all, what a poem does. But actually there's another famous piece of Latin forest-grove poetry, by Seneca, that I think lies behind 'This Lime-Tree Bower My Prison'. But what's at play here is more than a matter of verbal allusion to classical literature. As I say above: Coleridge, with a degree of conscious hyperbole, styles himself in this poem as lamed in the foot and blind. Doubly incapacitated. This may well make us think of Oedipus (Οἰδίπους ‎from οἰδάω, “to swell” + πούς, “foot”). Unable to accompany his friends, his disability nonetheless gifts him with a higher kind of vision. This vision, indeed, is really the whole point of the poem. He shares it in dialogue with an interlocutor whose name begins with 'C'. Dircaea circa vallis inriguae loca. In Seneca's play the underworldly grove of trees and pools is the place from which the answer to the mystery is dragged, unwillingly and unhappily, into the light. Seneca's Oedipus feels guilty, in an obscure way, before he ever comes to understand why. In 'This Lime-Tree Bower My Prison' Coleridge's Oedipal point-of-view is trying to solve a riddle, without ever quite articulating what that riddle even is, and our business as readers of the poem is to test it on our own pulses, to try and decide how we feel about it. My sense is that it has something to do with Coleridge's guilty despair at being excluded, which is to say: his intimation that he is being cut-off not only from his friends and their fun, but from all the good and wholesome spiritual things of the universe. The poem is saying, without ever quite spelling it out, that Coleridge's exile is more than an unlucky accident of boiling milk (maternal milk of all things!) spilled onto his foot. His exclusion is not adventitious. It relates to some deep-buried shameful secret, something of which he is himself only dimly aware, but which the journey of his friends will bring to light. Of course, for them this passage into the chthonic will be followed by an ascent into the broad sunlit uplands of a happy future; because it is once the secret is unearthed, and expiated, that the plague on Thebes can finally be lifted. But it's hardly good news for Oedipus, himself. I carry away with me all this land's death-curse. come you all along with me, come with me, be my sweet guides. Those italics are in the original (that is, 1800) version of the poem. What's particularly beautiful about that moment, if read the way I'm proposing, is the way it hints that Coleridge's sense of himself as a black-mass of ivy parasitic upon his more noble friends is also open to the possibility that the sunset's glory shines upon him too, that, however transiently, it makes something lovely out of him. There's a paradox here in the way the 'blackest mass' of ivy nonetheless makes the 'dark branches' of his friends' trees 'gleam a lighter hue' as the light around them all fades. But without wishing to over-reach that's also the paradox of Christ's redemptive atonement. Death is defeated by death; suffering by suffering; sin is eaten by the sin-eater; Oedipus carries the woes of Thebes with him as he leaves. Ivy in Latin is hedera, which means 'grasper, holder' (from the same root as the Ancient Greek name of the plant: χανδάνω , “to get, grasp”). It was sacred to Bacchus, and therefore wound around his thyrsis. Which is to say: it is both a poet's holy plant, as well as something grasping, enclosing, imprisoning. The Lamb-tree of Christian gentleness is imprisoned by something grasping and coal-black. I wouldn't want to push this reading too far, of course. It's safer to say that 'Lime-Tree Bower' is a poem that both recognises and praises the Christian redemptive forces of natural beauty, fellowship and forgiveness, and that ends on a note of blessing, whilst also including within itself a space of chthonic mystery and darkness that eludes that sunlight. The blessing at the end reserves its charm not for Coleridge, but 'for thee, my gentle-hearted CHARLES', the Lamb who, in the logic of the poem, gestures towards the Lamb of God, the figure under whose Lamb-tree the halt and the blind came to be healed. After all, Ovid's 'tiliae molles' could perfectly properly be translated 'gentle Lime-trees'. Agnes mollis, 'gentle lamb', is a common tag in devotional poetry. Of course Coleridge can't alter 'gentle-hearted' as his descriptor for the Lamb. If the poem leaves open the question as to whether Coleridge will share in that miraculous grace or not, that says as much about Coleridge's state of mind as anything else. This, as Goux might say, is mythos to logos visualised as the movement from aspective to perspective. And that is the poem in a (wall)nut-shell. I do genuinely feel foolish for not clocking 'Lamb-tree' before. It's the sort of wordplay that, once noticed, never leaves the way you read the poem. And then there's the solitary humble bee; Honey Pie perhaps? More seriously, that roaring dell is surely kith and kin to the deep romantic chasm of "Kubla Khan." & KK has that sunny dome which is seen by all those who heard the poet and were stopping their ears to keep themselves free of his enchanting voice. & Charles and STC both see the sun; you're right about that. We've got a bromance of sort going here. I suppose my favorite image from the poem is that of "two isles/ Of purple shadow!" – shadows of clouds cast on the water by the distant sun, which then appears in the poem. Clever poet this Lamefoot.